Where is it ? Only 20 kilometres from Faro Airport. Approximately thirty minutes journey by car. How big is it ? Big enough to host two championship golf courses and a Tennis Academy. Vale do Lobo is populated by exclusive resorts and detached villas. Who goes there ? Golfers and the rich and famous, however in the off-season the resort area is accessible to all and families can get great deals on renting a luxury villa for the week.It is also a popular resort with honeymooners. What about Food and accommodation ? The resort has some fine dining in the resort bars and hotels. Nearby Almancil can provide a better selection for some diversity. Vale de Lobo is an upmarket resort centred around A Championship golf course and Tennis training centre. It is Part of the so-called Golden Triangle Comprising Vale de Lobo, Almancil and Quinta de Lago. If you are after an up market holiday with a Beverly hills feel this is the place to go. However it has nothing to distinguish it as being Algarvian and if you are less footballers wifes and more coronation street then it might not be for you. 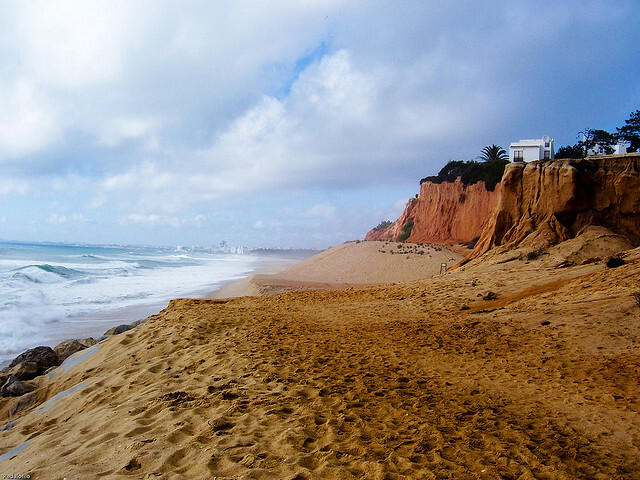 Over the years there has been tremendous development of Vale do Lobo and the surrounding area, and as a result the area has lost some of its original charm and character. The new owners have re-branded the “product” and seem strongly committed to maintaining and improving the resorts standards. As a result the whole resort is well maintained and the golf courses are in very good condition. In the year 2008 the two golf courses were very expensive (unless you have a discounted deal), are extremely busy and can be somewhat over-booked. The extra charge of 90 Euro’s for a buggy is excessive. Heading into summer 2010 there are a lot of deal for teeing off after 2pm – it’s always good to ask for the current deal or contact the various Golf Shops in Almancil including Augusta Golf who can get preferential rates. Royal Course: The course features the much photographed 16th Par three, which has spectacular views of the beach and coastline towards Albufeira. With a nearly 180 metres carry over two major ravines caused by erosion of the edge of the cliffs it is one of Europe’s most spectacular and difficult golf holes. Within Vale do Lobo the better restaurants are : Papagaios – with fantastic views of the beach and ocean and Oriental Teahouse (most portion sizes are easily enough for two) both of these restaurants are open all year round hence why they keep a good standard of pricing and quality.Locally, Iberico and Figueral seemed the best value with the Lemon Tree in Almancil well worth a try. There are many excellent quality Portuguese and english run restaurants in the local area including: Marufu 1 & 2, Rosa Do Camp, BJ’s Oceanside, Casa Do Lago, Aquarelle, A Quinta, Henrique Leis, Grissini, San Gabriel & Thai Garden, Micheals Gourmet Kitchen has the better chinese cuisine in the area – many restaurants have a lunchtime set menu from about €10 for 2 courses. Overall Vale De Lobo is a nice spot for a bit of secluded luxury , don’t forget your gold card ! Vale Do Lobo Local Website.